When it comes to junk food, I’m a sucker for salty snacks. If I get hit with a sudden craving for something unhealthy, it’s not usually something in the candy, cookie, or ice cream aisle…what’s usually calling my names is a bag of salty, greasy, MSG-laden chips. And when it comes to portion control, the old ad slogan about not being able to eat just one rings true…it’s pretty common for me to plan to eat just a couple of chips, only to find myself staring at my own reflection in the bottom of an empty chip bag….wondering where they all went! Often as not my stomach feels as bad as my conscience does after I indulge in that sort of thing, even when the chips are all-natural, organic and MSG free. I try to bypass this whole dilemma by not buying chips very often, but I still get that salty-crispy craving. I found that they sell huge bags of frozen organic green beans at a warehouse store where I shop, and I always keep a bag of them in my freezer. 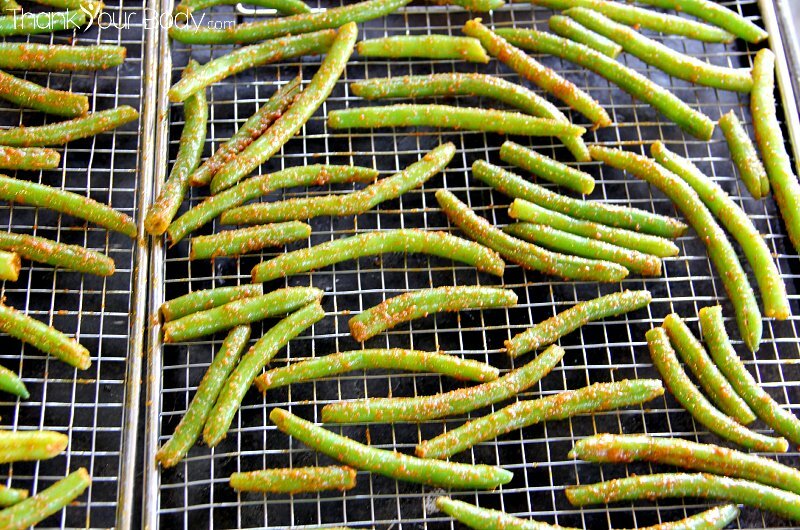 They are a great quick side dish when I don’t have anything fresh, and they work well for these green bean snacks. Toss them in a strainer and run warm water over them and they’re ready to go! If you have fresh green beans, just wash them and blanch them for a few minutes in boiling water, then drain them and set them aside. For the seasoning, mix together some dry spices. I found this recipe for BBQ spice online and I love it! It’s great on meat, and also perfect for snacks like this one. Toss the green beans with some olive oil and then add the spices and mix well. I happened to have a plastic zip-lock bag that was heading for the trash if it didn’t get re-used, so I put it to good use and threw everything in, zipped it up, and shook it until the beans were all coated with spices. A big bowl and a wooden spoon will accomplish the same thing. Place some wire racks on cookie sheets, and arrange the beans on the racks. Bake them in the oven at 395 degrees for about 1/2 hour. You’ll want to keep an eye on them, they may not cook evenly so you may find yourself pulling a few crispy beans out and letting others stay in a little longer. When they’re done, just let them cool off a minute and enjoy them! They are even good with a little homemade ranch dip. Who needs chips? These are just as good, and so much better for you! 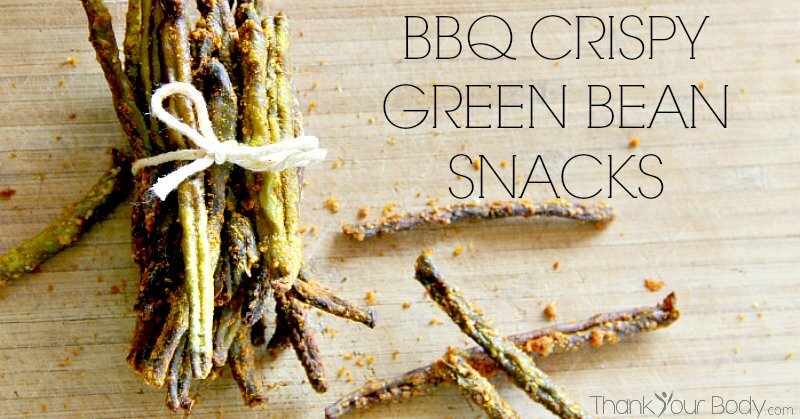 Always wanting a varied amount of veggies in our home this BBQ flavor crispy green bean snacks are perfect and delicious. Adapted from this recipe. Wash and trim green beans, and blanch them in boiling water for 2 minutes (if using fresh beans). Drain the beans and set them aside to dry. If you're using frozen beans, run them under warm water until they're soft and set aside. Mix all the spices together. This will make more seasoning than you'll need, so set aside the rest and use it later. Toss the green beans with the olive oil. Add the spice mix a teaspoon at a time, tossing the beans well between each addition. Place wire racks on a cookie sheet. Spread the beans out on the racks so that the don't touch, and bake at 395 degrees for 35 minutes. After 20 minutes, check the beans and remove any smaller ones that are already crispy and brown. Keep checking every 5 minutes to make sure your beans are crispy but not too brown...you may need a few more minutes or a few less, depending on the size of the beans, humidity, etc. Remove the beans and allow them to cool. Enjoy them warm, or keep them in an airtight container. If they're 100% crispy with no soft spots, you can keep them out on the counter...but if there are any softer spots, keep them in the fridge. I usually keep them in the fridge, just to be safe. What’s your favorite salty-crisp treat?